When I was in elementary school, my class went on a field trip to the Old Village Cemetery in Dedham, Massachusetts, my hometown. I remember running around trying to complete tasks, such as finding the earliest death date and the oldest age listed on a headstone, as well as doing several grave rubbings. Though I’m sure there was a history lesson embedded somewhere in the chaos of twenty nine-year-olds running amok in a cemetery, I have long since forgotten it. What has stayed with me, however, is a love for older cemeteries. 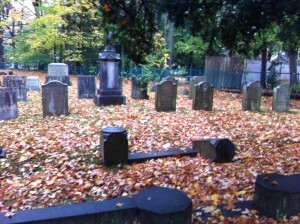 A couple of weeks ago, after watching the Halloween movie Hocus Pocus, and now fully in the Halloween spirit, I decided to visit the cemetery for the first time in several years. While walking through, I came across a plot for the Burgess family. The progenitor of the Burgess family in Dedham appeared to be Ebenezer Burgess, who was born on 1 April 1790 and died on 5 December 1870. What struck me about Ebenezer’s headstone was how detailed it was; his profession, Pastor of the First Church of Dedham, was listed on his monument, as was his birthplace in Wareham, Massachusetts. The monument also includes the maiden name of Ebenezer’s wife, Abigail Bromfield Phillips, and her birthplace (Boston) along with her dates of birth and death. The headstones of the descendants of Ebenezer and Abigail (Phillips) Burgess, which flank the monument, were also surprisingly informative. The front of each headstone listed the name of the deceased, including the maiden names of the wives of the Burgess sons along with dates of birth and death. The back of each headstone included names of parents, and in one instance, a birthplace. Edward Phillips Burgess and his wife, Mary (Burgess) Burgess, are buried side by side in the Burgess portion of the cemetery. 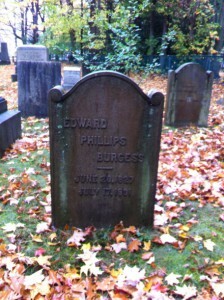 His headstone gives his birthdate (28 June 1827), and death date (17 July 1901), and the back of his headstone declares him to be the son of Ebenezer Burgess and Abigail Bromfield Phillips. Though headstones can sometimes contain extensive genealogical information like those found on the Burgess headstones, I have come across very few headstones with this level of detail. 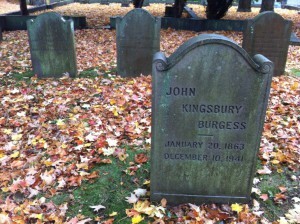 As these headstones, and now the Burgess family, interested me, I started researching the family. Perhaps it was Ebenezer’s interest in genealogy that led to such interesting and detailed headstones in the Old Village Cemetery, as a way to continue the Burgess genealogy. 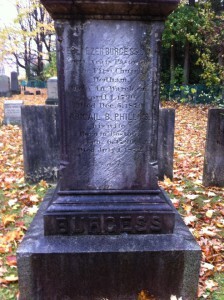 However these headstones came to be, they certainly sparked an interest in a family I have no (known) connection to, something Ebenezer Burgess clearly never expected. Katrina, It’s interesting how something like a cemetery visit, a mention of a family in a book, or a chance meeting with a stranger can impel the desire to know more about someone’s genealogy. Reading Queen Noor’s biography inspired me to research the roots of the Hashemites, the book, Devil in the White City, prompted research into seven generations of a person mentioned in the book, the unusual name of a customer at the business where I work inspired a several generation genealogy and history of that family. Perhaps I am just nosy, although I prefer curious, and perhaps the information will be of interest to someone else in the future. One learns so much history in the pursuit of genealogy. I too love old cemetery’s! I fell in love with them when I lived in Connecticut in the 60’s. Sadly you don’t find them in Oklahoma when I live now. Thomas Wight was a founder of Dedham, Medfield and Medway. I need to find out in which town his remains lie. Thank you for the story good timing! Funny I was just working on the (Irish/Canadian) Hawkins line and two of the Burgess daughters have married in around the early 1800’s. Thanks again. My family was not much for putting details on tombstones…I’m lucky to get a name and year. A recent multi-cemetery trip revealed stones marked “Mother” (no name or dates), one with a first name only (no, it hadn’t rubbed off, it just wasn’t there), and a hill full of unmarked graves. I’m jealous of those families with detailed stones! Katrina, thank you for your pursuit of history and the infinite ways your passions blessed the lives of those of us who are ever in quest of our kindred. Superlative narrative of an early America family. Kudos and accolades to you. I have a friend whose middle given name is Burgess. When I sent him an e-mail asking whether he knkew of your line, he said he doesn’t except that “Our ancestor from which my middle name comes was Winslow Burgess, a great, great, great something. He was a Ship Master in the middle of the 19th century. Because I got his name, Bonnie and I also got a sea chest, painting of his ship, and a tiny picture of him in a brass locket with a lock of his hair on the back.” Do you know of this man? Thank you. What a small, small world. I also grew up in Dedham, and as a kid I often went through the cemetery as a short cut into town and was fascinated by the old stones. 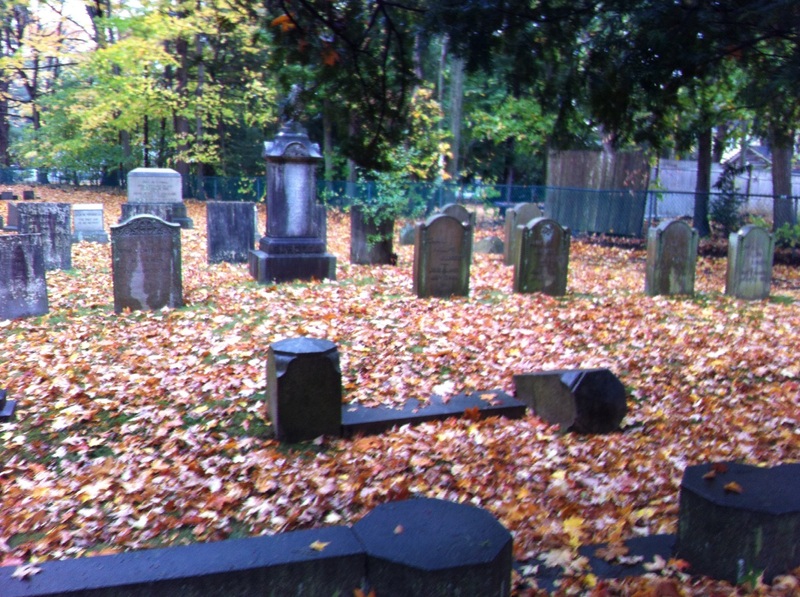 Decades later, after working for a few years on my family’s genealogy, it turned out that we had many relatives in that old cemetery, back into the 1600s. I now wonder if their old ghosts were watching me run through. And, a small aside, I’m related to Ebenezer Burgess as well.